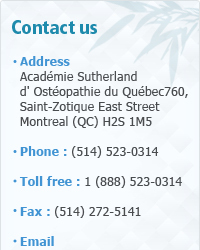 Since its creation, the Académie Sutherland d' Ostéopathie du Québec (ASOQ), changed the face of Osteopathy in Quebec. Most unique, this school forms very good osteopaths with a global vision of the human being. We are very proud of them. They are the ambassadors of a profession whose tradition of excellence is more than centenaries. In keeping with our signature : ’’ For a global osteopathy ’’, our pedagogic Director, Guy Voyer, DO, gives a precise and flexible direction at the same time to the ASOQ program. Competences are such that students having completed their training in other schools start again their training at the Academy Sutherland or come for improvement. ASOQ is proud of the leading role that it shows and of its contribution to the profession of osteopathy. More than ever the future of health care rests on the capacity of working in complementarity with other health professionals and able to give efficient and quality care. The Académie Sutherland d' Ostéopathie du Québec prepares you to fulfill this role in a fast-growing profession in Quebec and elsewhere in the world. I invite you to join our vision and put your knowledge and your love of the human being at the service of our fellow-countrymen in a perspective of prevention and treatment.